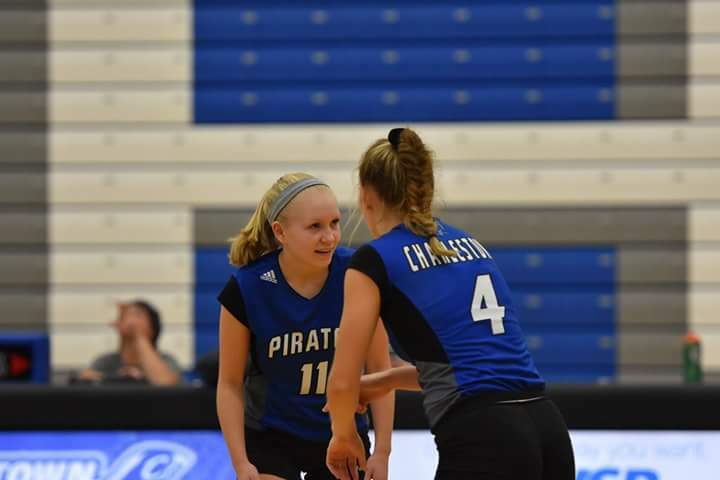 Charlestown Lady Pirate Volleyball traveled to Lanesville Wednesday evening for a non-conference match with the Eagles. Charlestown (10-6) got it’s tenth victory of the season after sweeping Lanesville 3-0 (25-16, 27-25, 25-12). “It was good to get a win tonight and have pockets of some solid performance. We started off slow and found ourselves down 13-16 before Senior Hannah Vincent came up to serve 12 straight points to help us win 25-16. The second set we just battled back and forth with them but were able to win the close set. The third set we were more in control and took an early 8-2 lead and was able to keep it. Hannah Vincent really stepped up and helped us with her serving having 20 service points on the night. Chrissa Ledbetter had some great hustle on defense and came up with some big digs. Molly Braunecker and Maddie Nuxoll also had a good defensive night”, commented Lady Pirate Head Coach Tammy Nuxoll. Senior Kaia Reid led the offense with 17 kills and Nuxoll had 24 assists. “It been a long week but we will need to keep pushing forward for our third match of the week tomorrow against Salem”, concluded Coach Nuxoll. The Charlestown JV squad got their second straight win, improving to 6-5 on the season with a 2-0 win over Lanesville (25-20, & 25-19).